According to the chart above, provided by IDC, the total amount of PCs sold during the quarter amounted to just over 80 million units. This 80 million number is just a piece of the projected total of 308 million PCs sold during the entire span of 2014. 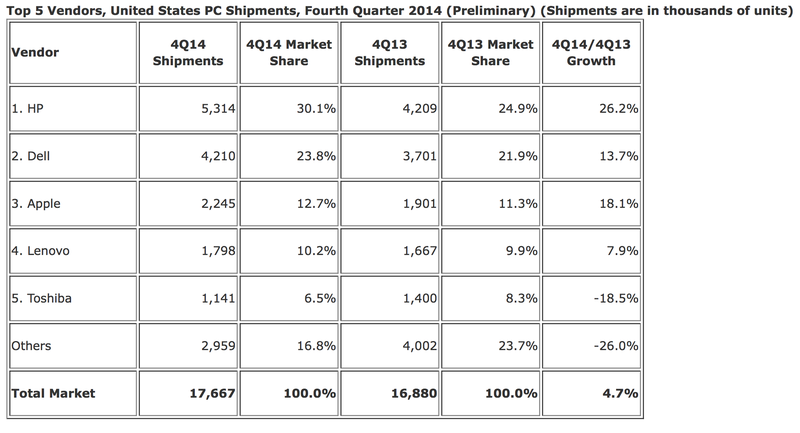 Lenovo still ranks as the number 1 PC vendor in terms of unit sales, with HP, Dell, Acer, and Apple (in order) rounding out the top 5. While Apple is the 5th on the list for global sales, the Cupertino-based company ranks as high as number 3 in the rankings specific to the United States. IDC projects that Apple sold 5.75 million Mac units during the holiday quarter and that 2.245 million of those machines were sold just in the United States. As Ben Bajarin notes, this 5.75 million number (if accurate) would mean that the 2014 holiday quarter is Apple’s best all-time quarter for Mac sales. Apple hit an all-time high for Mac sales in its previous quarter of 2014 with 5.52 million Macs sold during the quarter. Apple reports results on January 27th. During the year-ago holiday quarter, Apple sold 4.8 million Macs. The uptake in Mac sales may be due to the release of the Retina iMac and various updates to the Mac mini, MacBook Air, and MacBook Pro.